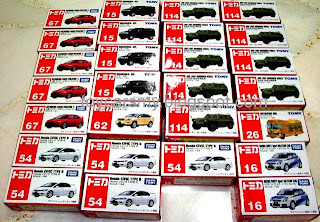 Finally I received my shipment from oversea, some for the models are not available in Malaysia, example JSDF and the Evo X. The whole package weighted more than 1 KG. Cars for this order already pre-reserved by my close friends. It is not cheap to bring in from oversea, but it still worth due to the rareness in Malaysia. I have yet come out a solid plan to receive orders from open market. If interested, please check my blog for announcement from time to time.